Hock Tan had a trick for winning over skeptical investors. When people asked why he was so confident that Washington would approve his $117 billion takeover of Qualcomm Inc.
, Tan would take out his cell phone and show them a photo of himself with U. As the world now knows, the chief executive officer of Broadcom Ltd.
made a wild miscalculation on Trump. Instead of siding with Tan, the president shot down what would have been the largest technology deal in history. The reverberations have only just begun. Trump dinged the deal on national security grounds -- but not because Broadcom, which is based in Singapore until it redomiciles to the U.
later this month, posed an immediate threat. The big worry was China, Trump’s nemesis in trade, in the form of telecommunications giant Huawei Technologies Co.
How could Tan, who is stocky and often sports a rakish grin that belies the workaholic beneath, make such a blunder? The story of Broadcom’s Washington misadventure is a lesson in global deal-making for the Trump era. A letter asking for an investigation sent by Qualcomm, which outspent Broadcom by almost 100 to 1 on Washington lobbying last year, seems to have connected with a president whose protectionist impulses have now taken shape in tariffs on foreign steel and aluminum. Wall Street bankers are still trying to assess the implications; few say the decision bodes well for M&A. Trump’s verdict bookends Tan’s unlikely path from White House favorite to acquirer-non-grata in just four months. Tan, a 66-year-old deal addict who built Broadcom from an unwanted spinoff of Hewlett-Packard to one of the giants in the $400 billion semiconductor industry, on Wednesday was forced to concede defeat: Broadcom would formally abandon its bid for Qualcomm. But it also pledged to carry through with plans to move its headquarters to the U. -- a move that appeared to be designed to appease officials and, possibly, open the way for other acquisitions. This account of what happened is based on conversations with multiple people who worked on Broadcom’s bid and Qualcomm’s attempts to stop it, and from investors asked to support it. Representatives for both companies declined to comment. The Oval Office The night before Tan was due to meet Trump last November, he wanted to practice his speech. Again and again, he ran through the lines on a small group of advisers. The Malaysian-born CEO, who’s been a U.
citizen since 1993, planned to begin by saying his mother could never have believed that he’d one day stand shoulder-to-shoulder with the president of the United States. The words were carefully choreographed but the emotion was genuine, a person close to Tan said. The CEO was excited to be going to the White House. The visit, enshrined in videos uploaded to the president’s Twitter feed of Trump and Tan laughing together, was a success. 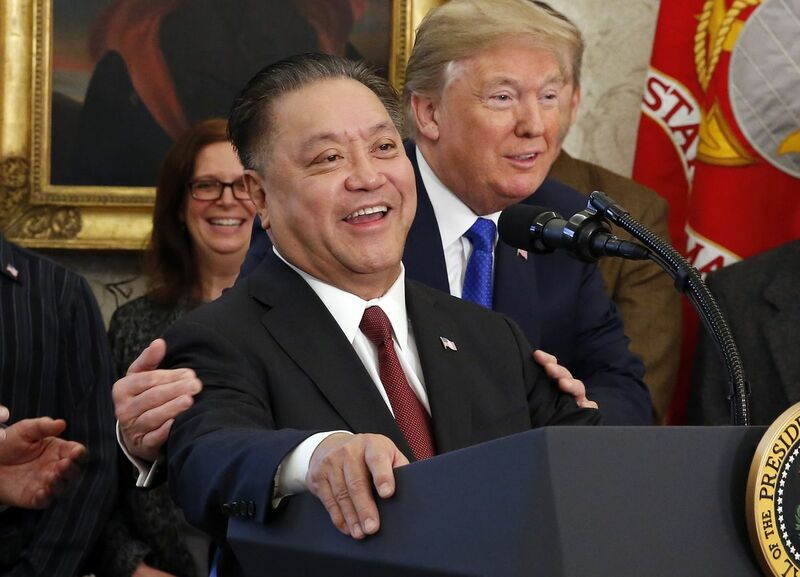 Tan praised Trump for fostering the business-friendly climate that had encouraged him to bring Broadcom -- a company created through acquisitions -- back to the U.
Trump, in turn, proclaimed Broadcom as one of the “really great, great companies. ” Analysts applauded Tan for making a canny move to smooth approval of his pending acquisition of Brocade Communications Systems Inc.
Twenty-four hours later, it became clear that everyone was underestimating Tan’s ambition, when Bloomberg broke the news that Broadcom was planning to go after Qualcomm, the biggest maker of mobile-phone chips. The $70-a-share offer, when it came, immediately catapulted Tan into far less amicable conversations. From the start, Qualcomm’s board characterized Broadcom, and Tan in particular, as opportunistic financial engineers who lacked appreciation for the kind of long-maturity research and development that the semiconductor industry needs. In a rare display of emotion, Tan’s counterpart at Qualcomm, Steve Mollenkopf, said the offer “wasn’t even in the ballpark. ” The Qualcomm board backed Mollenkopf’s sentiment; investors called the offer an attempt to steal the company. When Tan bumped his offer to $82 a share in early February, Qualcomm continued to demur. For their part, Broadcom’s management pointed to a track record of creating outsized shareholder value and the benefits of building a semiconductor powerhouse. Qualcomm, left to its own devices, would continue to spend shareholders’ money on overambitious expansion schemes, they said. But as the fight dragged on, it morphed from a tussle over price into what at times felt like a referendum on the future of the technology industry: A choice between profits and innovation. Valentine’s Day Broadcom seemed to have grasped the importance of these cultural differences when, as the two sides eventually met in New York on Valentine’s Day, Tan took a back seat. Instead, he left it to Henry Samueli to deliver the pitch, according to people who attended the meeting. Samueli, the co-founder of legacy company Broadcom Corp.
, had been in this position before, just on the other side of the table -- when he was negotiating the 2015 merger of his company with Tan’s Avago. The electrical engineer tried to appeal to Qualcomm from the standpoint of a skeptical techie founder who’d been won over by Tan and eventually sold his startup to the businessman. Now, by his own account, he was relishing the ride. “I’m enjoying it a lot and learning at lot from Hock,” Samueli said in an interview. ” During his 20-minute appeal, Samueli encouraged Mollenkopf and his counterparts, including the son of Qualcomm’s founder and its then-chairman, Paul Jacobs, to follow him in changing their thinking about the semiconductor industry. The message: Trust in Hock. That technology had to be at the center of the conversation -- rather than price and closing terms of a deal -- illustrates just how far apart the two sides were. Simply put, Tan believes that the 50-year-old semiconductor industry’s growth spurt is over. The sector that led to the U. ’s dominance in technology and fueled the creation of Silicon Valley will struggle to grow quicker than the overall economy going forward, he argues. Instead, companies should shelve risky investments and concentrate on maximizing profits. Opposite him were two men behind Qualcomm’s effort to push its chips into laptops, server computers and cars, making the kind of expensive bet that Broadcom thinks is a waste of money. Jacobs and Mollenkopf were unmoved by Samueli’s pitch, the people who attended the meeting said. While both men are younger than Tan, they’re steadfastly old school in their view of how a chip company should be run. Engineers by training who hold more than 20 patents between them, the pair embody Qualcomm’s belief that a chip company’s job is to develop leading technology then invest to spread its use into new markets. With that belief, it was hardly surprising that neither man was swayed by Tan’s alternate worldview. And when Broadcom proposed new directors for Qualcomm’s board ahead of its March 6 shareholder meeting, the idea of the sides negotiating on friendly terms all but evaporated. Votes In The votes started to come in on Friday, March 2. By Sunday it was clear that Qualcomm’s defense had failed. Four of the six directors Broadcom had nominated were polling so far ahead of their Qualcomm peers that the race was effectively over, according to data viewed by Bloomberg. The remaining two were winning by less substantial margins. Making it worse, Mollenkopf and Jacobs, the architects of Qualcomm’s standalone plan, had received some of the fewest votes. Inside the Qualcomm camp, the mood was bleak; assuming the trend continued, the board would lose control of the company at the shareholder meeting. Broadcom’s message was one of quiet confidence. The company knew it had won, one person close to the discussions said. At that point, the person said, it was just a question of by how many votes, and who was going to leave the board. Early on Sunday evening, with victory a sniff away, members of Broadcom’s deal team gathered at the Hyatt Regency hotel in San Diego, a 30-minute drive from where Qualcomm’s shareholder meeting was set to be held. Tan stayed at home in San Mateo. But even as he was winning the battle for shareholders, Tan had failed to see trouble gathering away from Silicon Valley. At a little after 9 p.
local time that night, the U. Department of Treasury contacted both companies’ lawyers. They were concerned that a merger of the companies presented a potential threat to national security, and more specifically that Tan’s record for private equity-style cost-cutting could damage Qualcomm’s, and therefore America’s, long-term technological competitiveness. Both companies were instructed to temporarily abandon any pursuit of a deal. In a letter made public by the Committee on Foreign Investment in the U.
the following day, it emerged that the investigation was the result of Qualcomm having voluntarily filed a notice seeking a review of Broadcom’s efforts to secure seats on its board. The move by Qualcomm -- unilaterally seeking a review of a theoretical merger -- is, according to several former CFIUS employees who agreed to speak on the condition of anonymity, highly unusual. As Broadcom’s team scrambled to get up to speed in Washington, one thing became quickly apparent: Qualcomm had beaten them to it. Many of the people that the company tried to hire there were already working for Qualcomm, according to two people close to Broadcom’s efforts. Another person familiar with the matter said that Tan had refused to spend on lobbying until it was too late. Federal lobbying disclosures for 2017 showing that Qualcomm spent $8. 3 million, or roughly 100 times the $85,000 Broadcom spent, appear to support this theory. Top Secret On Monday of this week, Tan was in Washington, convinced he still had time to bring around government officials who’d earlier that day publicly rebuked Broadcom for speeding up plans to move back to the U. He went to a meeting at the Pentagon in the afternoon aiming to explain that he was no threat to U.
Tan and his team pitched hard. Broadcom was, they argued, a quintessential American success story; a spinoff from Hewlett-Packard that only moved its legal address to Singapore to escape a corporate tax system that Trump had repeatedly branded as broken. Moreover, the company was now coming home. As for his personal credentials, Tan explained that he had held Top Secret security clearance and had, as the CEO of a smaller chip company, worked on components for a piece of U.
military hardware designed to shoot down incoming missiles. The tone of the meeting was cordial and Tan and his team left believing they had a good shot at salvaging the deal. Within four hours, President Trump issued an order that downed those hopes forever. “There is credible evidence that leads me to believe that Broadcom Ltd.
might take action that threatens to impair the national security of the United States,” Trump said. Back in November, when Tan was at the beginning of the fight, he gave an interview to Bloomberg. Confident that his M&A nous, newly underwritten by the self-styled deal king in the White House, would win the day, he laughed off questions about his secret recipe for acquiring companies. “I guess I’m just very good at it,” he responded. That kind of conviction may have won over investors. But for politicians increasingly anxious about the future of America’s industrial superiority, a solid record for money-making doesn’t count for much these days. Nor, apparently, does a photo op with their boss. — With assistance by Alex Barinka, David McLaughlin, and Ben Brody.